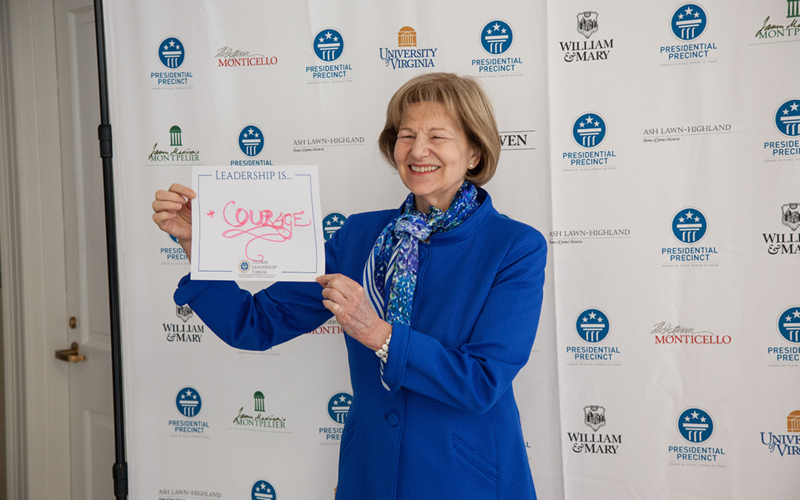 During her visit to the US last week, Baroness Nicholson spoke to thought leaders at some of the United States’ most prestigious American Universities, delivering remarks on leadership, religious freedom, and the situation of refugees and IDPs. She attended the Presidential Precinct’s 2016 Global Leader’s Forum with Former Secretary of State Madeleine Albright at UVA in Charlottesville, spoke with Katrina Lantos Swett on International Religious Freedom at Princeton, and delivered a keynote speech highlighting AMAR’s work at the Conference on Migration and Human Safety at Yale. The Baroness’ tour began on Tuesday, March 29th at the University of Virginia, where she took the podium at the 2016 Global Leadership Forum. In her keynote speech, she spoke about the importance of a three-pronged approach to solving IDP and refugee crises, indicating that government, business and the non-profit organizations all have a role. “I see the creation of good and stable law as the first thing to do with people in trouble. If you don’t have law you have nothing to rely on, to improve. No democracy in any form. The law is the concrete platform on which democracy stands,” she continued. In the evening, she met with former Secretary of State Madeleine Albright at a VIP reception and dinner hosted by UVA President, Theresa Sullivan. During the reception, Secretary Albright was presented with the inaugural Edward R. Stettinius Jr. Prize for Global Leadership. On Wednesday the Baroness traveled up to Princeton where she joined Dr. Katrina Lantos Swett, President and CEO of the Lantos Foundation for Human Rights and Justice, in a Public Conversation on the State of International Religious Freedom. During the moderated debate, Baroness Nicholson highlighted AMAR’s Religious Tolerance program which is achieving impressive results in bringing faith communities together in the south of Iraq. “The program is so exciting, because not only is it unique, but it’s working. We have brought all six of the major faiths in Iraq together by starting at the top with the religious leaders. We asked them to stand up in front of each other and explain and discuss their faith. This was the start and it’s working beautifully. The European Union has provided us funding for three years, but we are already looking at further money to ensure this continues and can be transferred to other parts of the country,” explained the Baroness. Baroness Nicholson wrapped up her tour on Thursday at Yale’s MacMillan Center for the Conference on Migration and Human Safety discussing refugee crises around the world. Delivering keynote remarks on “Loss of Life and Human Safety Challenges,” Baroness Nicholson called for a new world order for the sake of IDPs and refugees, noting that “the average stay in a camp for the world’s IDPs is now 11 years.” A video of the presentation and details about Yale’s Fox International Fellowship can be found here. The Baroness spoke about AMAR’s work on public health. She said this vital work brought calmness, stability and hope to the most underserved communities. “Health is key in my mind for human safety. But a human is more than just a machine which needs feeding and watering. We must have learning, so that means education too. Without providing learning you are giving the IDPs a half-life, a life in the shadows. Nothing really that can give them an opportunity to be themselves,” the Baroness continued. After highlighting AMAR’s work, achieved on a comparatively tiny budget, and its determination to provide permanent solutions in all its projects, she called on the students and academics at Yale to get involved.